Just like what I had with the Chanel nail polish - Distraction, you sometimes find another nail polish brand with the exact same color as the Chanel nail polish that you cannot manage to get your hands on, but it is just missing the fine micro shimmer. I have bought many green nail polishes before that I thought were Chanel Jade dupes, but they just seem to be missing something. 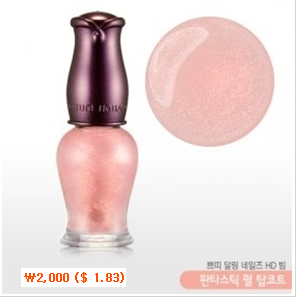 This is when I remembered buying a shimmery top coat from Etude House. In the picture, it looks very cotton candy pink, but it only creates a sparkly, transparent layer on the nails. I don't know why, but my bottle of nail polish is very yellow and totally different than in the promotional picture and in the pictures of other reviewers. Either it turned this way during transport or it already turned bad in the warehouse, but it still does the job perfectly. If you look closely at the nail polish bottle in the picture on the right, you can see the fine micro shimmer in many different colors such as pink, blue, purple, and orange. 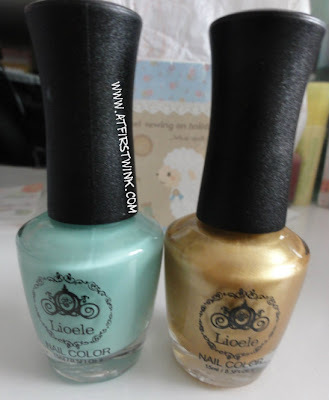 For these two false nails underneath, I used the Lioele nail polish nr 38 (lighter green) and the Sasatinnie nail polish FCW032 (darker green). After they dried, I have put the before mentioned Etude House top coat over it. It is really hard to capture the shimmer and the right color of the nails. In real life, the mint green looks a lot greener and the darker green a bit more jade like, if you know what I mean ^_^. So if you want to create your own Chanel Jade nail polish or other shimmery nail polishes, please give my little trick a try. The nails in different lighting. Lioele no. 38 and no.13, I recently bought these at the Colour mix store in the Central subway station in Hong Kong, paying HK$70 for two bottles. I found another nail polish that looks similar to the color of the Chanel Jade, the HEMA nail polish #843 Dark Sea foam. In the pictures underneath, I have added the Etude House fantastic pearl top coat on top for the Chanel shimmer effect.